Back in the wild and wooly days of 1994, shareware was the distribution method of choice for PC games. Remember the good ol’ days when you could download episode one of Doom for free, then give id Software money for the rest of the game? Novel concept back then, and things are starting to come full circle what with DLC and the like. But I digress. Rise of the Triad was a shareware hit in the 90’s, thrusting folks into the boots of the H.U.N.T. (High-risk United Nations Task-force) squad. Originally conceived as a sequel of sorts to Wolfenstein 3D, Rise of the Triad had players blasting away an evil cult with a vast arsenal of weapons including bazookas, MP-40s, and Walther P38s. While not quite the hit that Doom or Wolfenstein was, the game was an underground success. 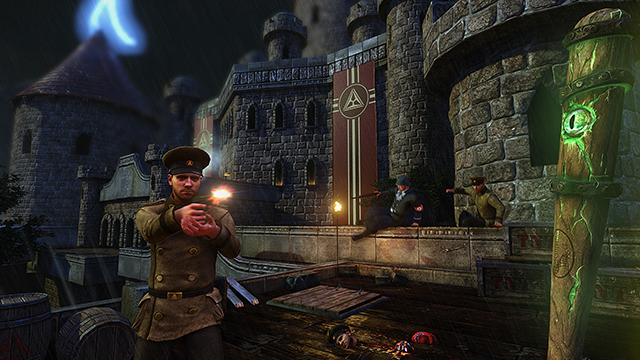 This new Rise of the Triad is the remake/reboot/thing of the 1994 original. And you know what? Nothing’s changed. I mean, the Unreal Engine 3 produces some beautiful vistas and environments to blow your opponents to bits in, and sure, you can aim down the sight of the pistol. But everything that made the original so unique is back in full force. The incredibly fast movement, different classes of characters, and unique weapons all round out a complete package. The game’s multiplayer mode was shown off at the PAX East show floor, and allowed six of us to get together and blow each other to smithereens. And the old-school mentality extends beyond the actual game itself. Dave Oshry, marketing director of the game, kept hammering the point across to all in attendance. It’s that kind of mentality that shows throughout the game. It’s as old school as historic educational institutions can get. Oshry even hinted at bots, so you can play the multiplayer offline, or fill some spots online. Overall, the game feels fantastic. Moves are responsive, even if the jump is a little floaty at times. Each weapon feels fantastically responsive, even in this pre-release build. And the best part? If you’ve ever played a shooter on PC before (and I mean any), you’ll feel right at home. But then again, folks who’ve never played a Quake game and are interested in Rise of the Triad may want to start small and take on bots to start. The game is very unapologetic towards new players, and there will be no Call of Duty-esque ranking system. So you’ll have no idea if XxDeathBonerxX is playing at a pro-level, or is canon fodder. I’ve been longing for more classic feeling PC FPSes ever since I first played Painkiller back in 2005. With Rise of the Triad, my jowls are quivering in anticipation. Look for it this summer on Steam and DRM-free GOG.